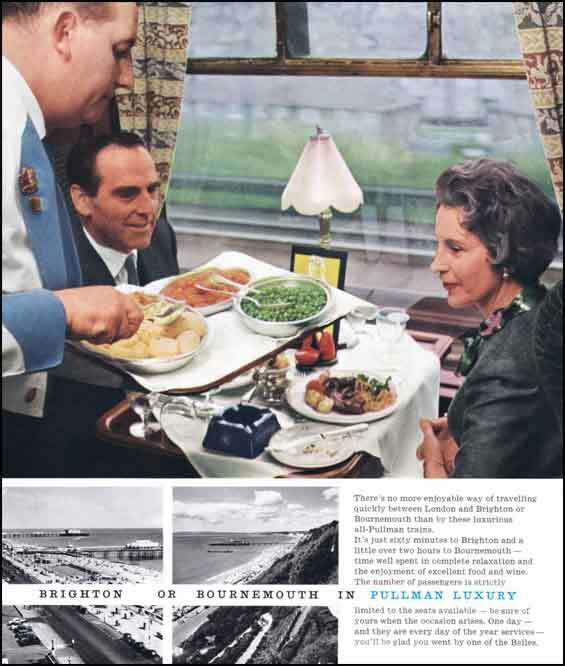 In 1908 the London Brighton and South Coast Railway introduced the Southern Belle, a locomotive-hauled, extra-fare, luxury Pullman Car service that ran between London (Victoria) and Brighton. In 1908 the London Brighton and South Coast Railway introduced the Southern Belle, a locomotive-hauled, extra-fare, luxury Pullman Car service that ran between London (Victoria) and Brighton. The construction was effectively monocoque, a strong way of constructing carriages, not followed universally until the 1970s. This had a bearing on the proposal to return the Brighton Belle to the main line 80 years later. The interiors were beautifully decorated in the Art-Deco style, with avant-garde designers and famous furnishers like Maple fitting out the interiors. Third class cars had saloons with 2 bays of 4 seats, separated by a table, each bay with a big window. First class had individual armchairs 2 across the car, with a table and seat opposite, each by a big window. Each first class car had an exclusive 4 seat coupé compartment at the end the saloon. By all accounts the train interiors were stunning, and caused a sensation. The train was instantly recognisable with its umber and cream exterior contrasting with the Southern Railway’s green carriage livery. It was thought that the seating in third (denser than the normal Pullman 2+3 bays) was acceptable for the short one hour transit. First remained essentially the same as Pullman elsewhere in Britain. The morning trains normally served a breakfast style meal, the rest of the day there were meals served from the table d’hote or á la Carte menus, with afternoon tea and supper as appropriate. The meals varied but later in the train’s declining years meals were ‘lighter’. The Pullman interior and individual service was held to be superior to first class accommodation on any other train. The unique new Pullman electric express multiple units entered service in January 1933. The Pullman Car Company provided the service on board, for which they charged a supplement. 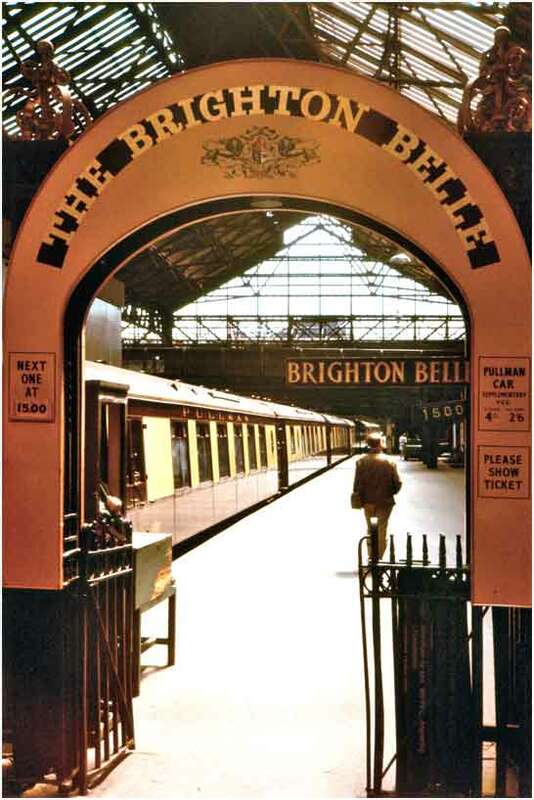 In June 1934 the title was changed to Brighton Belle. The extra fare, 2/- third and 3/- first supplement went to the Pullman car Co who ran and manned the trains with attendants. The Belle ran three trips each day until 1940, when an air raid on London (Victoria) damaged one set, and all three were withdrawn to be stored until the end of hostilities. Post war, the Belle resumed its duties, with two out of the three units in traffic, coupled together, and the third in maintenance, or ‘special duties’, like a royal train, charter or a visiting head of state. Apart from some scheduled Sunday forays to Eastbourne, the Belle stayed rooted to Brighton. Eventually the war years of storage were used up and in the face of more modern stock, the Belle had either to be expensively modernised or retired. 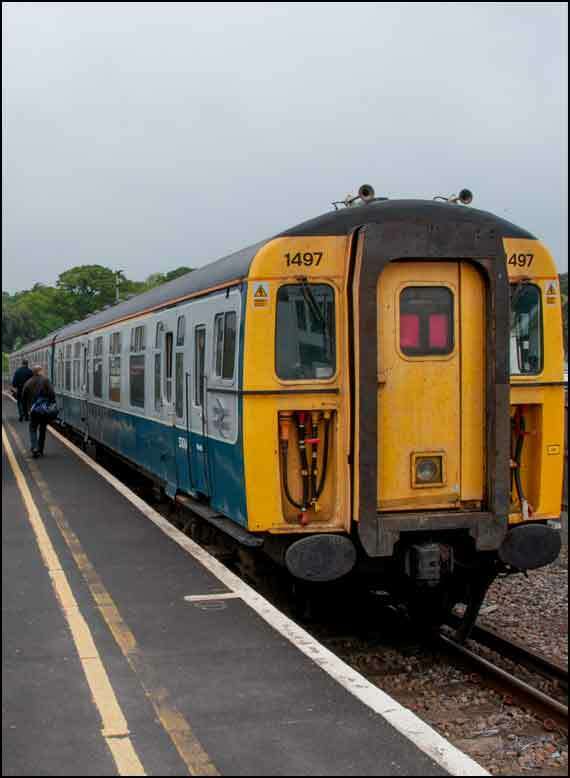 In 1969 the trains changed externally from umber and cream to BR corporate blue and grey. Within, the interior was strangely muted, with corporate standard fabrics and carpets. The modern colours certainly did not sit well with the Belle’s exotic Art Deco interior that by this time had lost much of its glow. The whole train began to look old and tired. In the 1960/70s although British Rail was in the business of running Pullmans on Inter-City routes, the three fading, 1930s multiple unit trains id not compare well with the modern 1960s trains. These were fast and comfortable enough to justify withdrawal of the aging Brighton Belle without replacing it with new luxury stock. 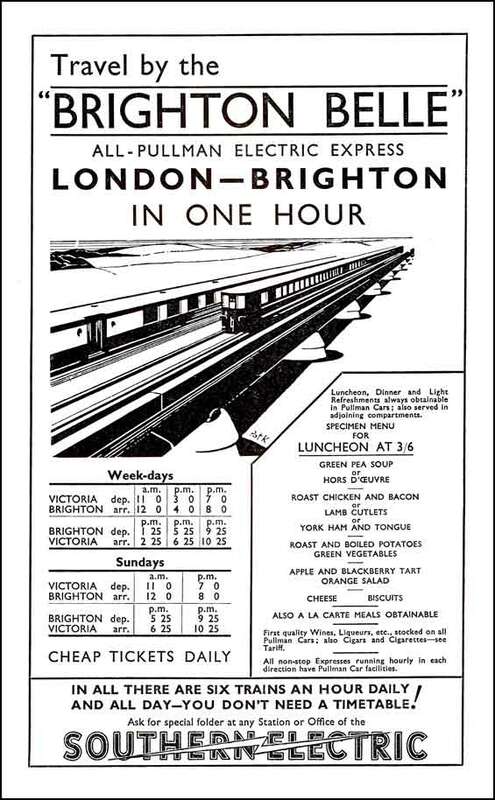 Rebuilding was considered uneconomic either, thus the Brighton Line train service became uniform with the modern trains taking over and Brighton Belle was withdrawn for scrapping. The newer trains rode very well and were warm in winter, but of course they never came close to the luxury and atmosphere of the Brighton Belle. However, the public liked them. 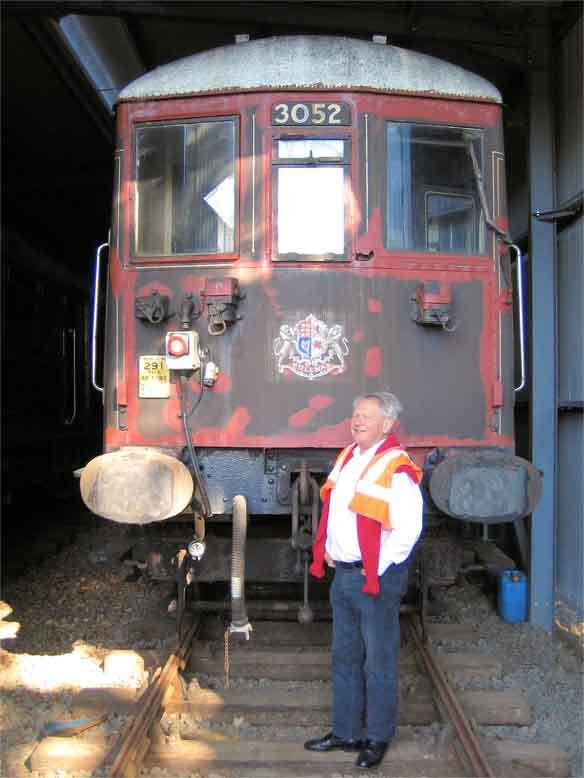 Restoration as a working electric multiple unit, although the sensible course for sustainability, has offered some difficult problems to solve, and the reason the Brighton Belle project is taking so long to complete lies at the heart of this problem. However, all difficulties are being overcome, and a Brighton Belle train will take to the rails again quite soon.